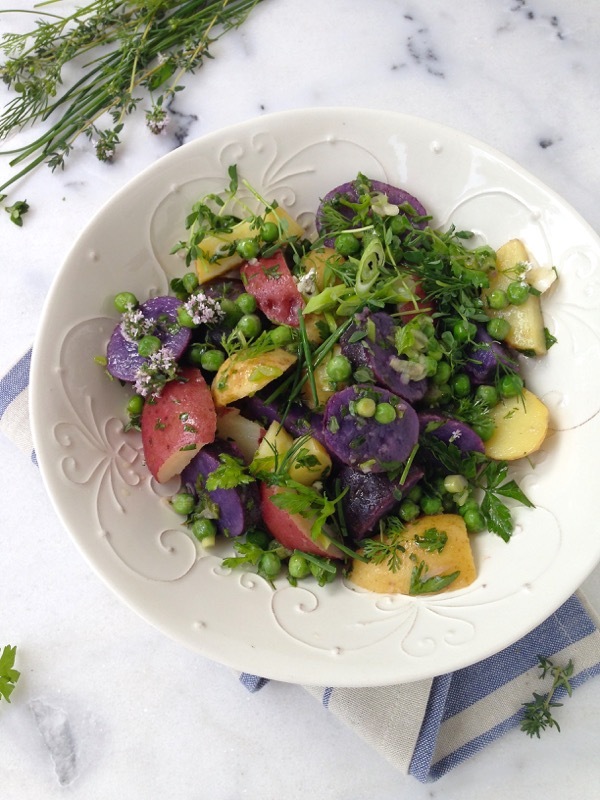 A healthy Italian potato salad recipe, made with colorful red and purple heirloom potatoes, fresh herbs and spring green peas, then tossed in a lovely, light and zesty homemade Italian style olive oil dressing. Easy peasy, without mayo and dairy free! Just smooth extra virgin olive oil, lost of freshly squeezed lemon juice or a splash of your favorite vinegar, fragrant basil, dill, oregano, thyme and a few cherry tomatoes. Who knew, something so simple could be so delicious ?! The mixed colored potatoes here add not only a visual pop, but also subtle variation in taste. Together with the green peas they make a marriage to be envied. Feel free to give it your own spin with green beans instead of peas, chopped fresh rosemary, capers, olives and some marinated artichoke hearts. You’ll notice the recipe calls for fresh peas that are steamed for a few minutes, to preserve as many nutrients as possible. If you can’t find fresh peas at the market, go for frozen green peas that you run under some warm water for a minute to defrost. To make a meal of things, feel free to add some toasted pine nuts, fresh radishes sliced paper thin, then sprinkle the entire salad with a handful of green pea shoots or baby arugula. I’ll usually go for whatever is pretty and in season. Though I feel this potato salad is best served warm to balance the freshness of tomatoes and the crunch from the radishes, it really is just as lovely served chilled. 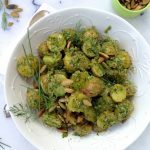 Makes a great side dish for a 4th of July or Labour Day outdoor party and great leftovers for lunches to go too. 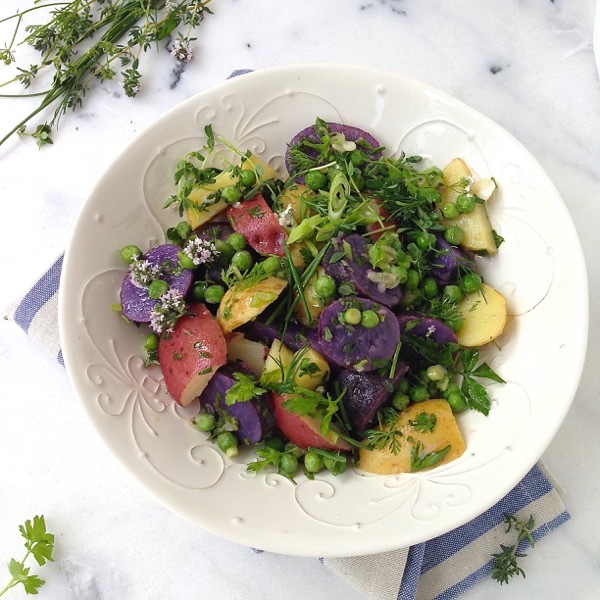 A healthy Italian style potato salad made with a mix of red and purple heirloom potatoes, fresh herbs and spring green peas, then tossed in a lovely light and zesty vinaigrette. 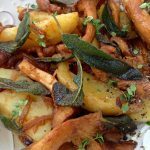 Rinse and cut the potatoes into rustic thick slices or wedges. Cover them with cold water and bring to a boil. Season with a good pinch of sea salt and simmer away until tender but still al dente, about 10 minutes. Drain and set aside to dry in their own steam for a few minutes. 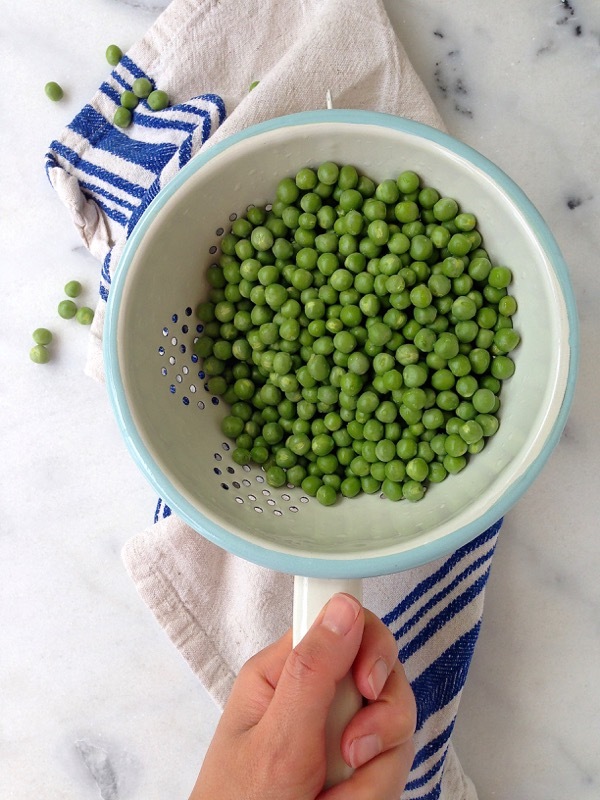 While the potatoes are cooking, steam the green peas for 3 to 4 minutes until al dente. In a large bowl whisk together the olive oil, lemon juice, most of the herbs (reserve some for garnish) and season to taste with sea salt. Adjust seasonings until happy. Add the cooked potatoes and green peas to the bowl with the dressing. Gently toss to coat. Allow the potatoes to sit in the dressing for about 10 minutes to absorb all the flavors. Adjust seasonings to taste with more sea salt and serve sprinkled with the remaining herbs, pea shoots, and scallions. Sprinkle with sliced grape tomatoes, radish or cucumber slices before serving. What a great salad, Florentina! I love the color, especially the purple! Thanks Suzy, I’m with the purple too, they got me ha! Florentina – WOW! Check out the colours going on there – wow wow!! And thank you so much for the mention!! 🙂 Pinning away. This is so pretty! This beautiful-ness came from your garden?! Wow. 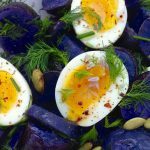 The colours are wonderful, it looks so healthy and delicious and…. I want a bowl stat. 🙂 Will certainly be grabbing the goodies from the Farmers Markets on the weekend to make. Might even make me feel a little more cheery about the fact is freezing here at the moment. Ah, we just had a cold week in Cali but sunshine is back and summer in full swing! I make the most colorful dishes when it’s ugly outside for that exact reason, they cheer me up. What stats do yo want about the bowl ? I only have 1 of them, some clearance find from Italy. Beautiful photos. This salad looks stunning and I bet tastes even better. Thanks Maureen! That’s how I get my peas in the system ! such a pretty, vibrant dish! Those colours are just wonderful. ps – just yummed this too. What a pretty and fresh looking bowl of food! The colours are just beautiful. It sure beats traditional style mayonnaise laden potato salad! I can’t wait to try it. Love the color of this dish! Gives me incentive to try purple potatoes! You must try purple potatoes ! So much fun and flavor ! Love this and your photography is beautiful. Thank you Cristie, that means a lot. Have a great weekend ! This looks too beautiful to eat. Love all the colours in this dish – so stunning! This is such a lovely recipe. 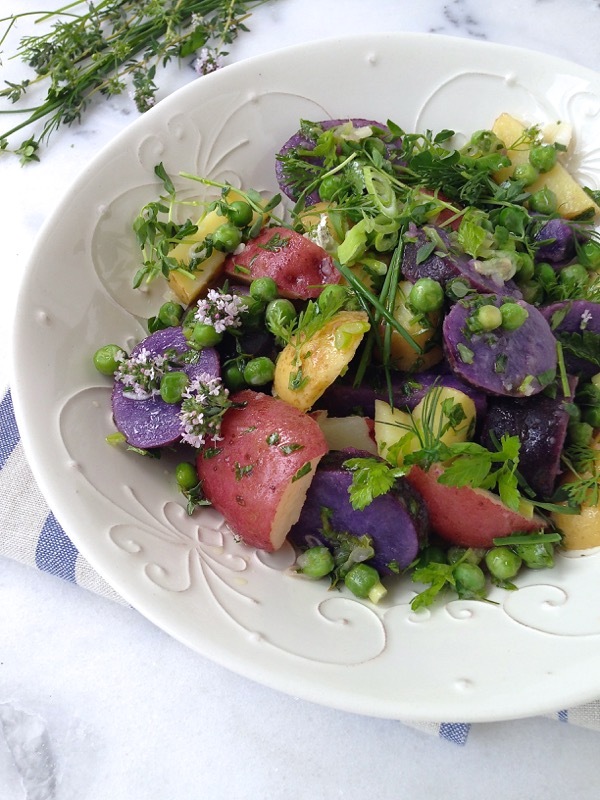 The different coloured potatoes really do add a wow factor to this side dish. I’m currently growing my own radishes and rocket (arugula) at the moment. I’ve been making so many salads using rocket and parmesan. I can’t wait for my tomatoes and cucumbers to be ready. 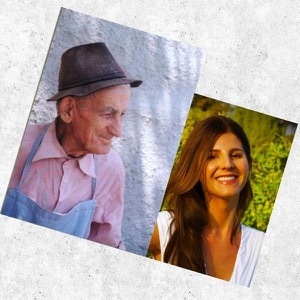 This is a lovely read and a beautiful blog. That is so great ! It is too hot in SoCal for arugula to do great, but my tomatoes are out of control, I am a little obsessed with growing tomatoes and eating them of course. What varieties do you plant ? Beautiful, Florentina!! 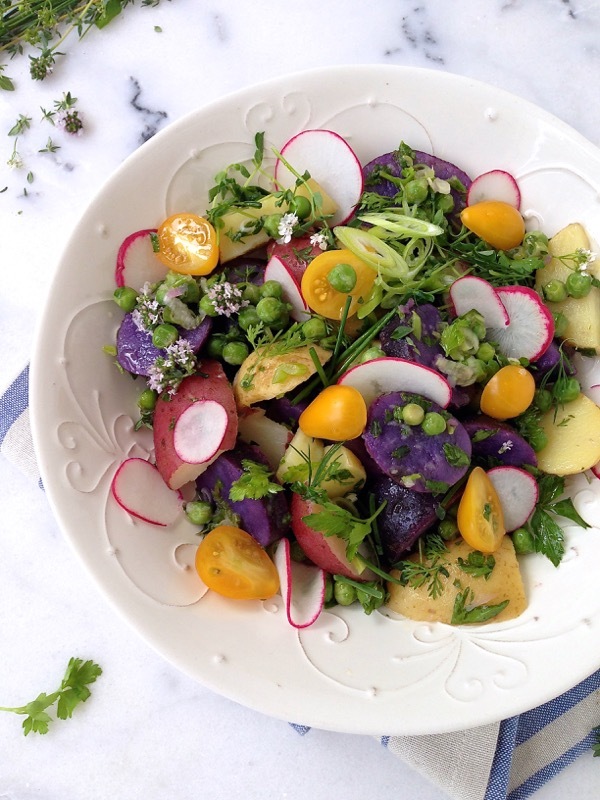 I think this is the prettiest potato salad that I have ever seen! 🙂 I’m all about using our garden’s ingredients to prepare healthy dishes at the moment, too. Isn’t summer the best? Yummed this one!! Nice purple potatoes. Will try this for sure. This is a gorgeous summer salad. The peas and pea shoots add such a nice pop of green. Sometimes I find potato salad a little “blah,” and choose not to make it just because of the presentation. This one I’d be proud to serve! I know what you mean @Patti . That is why this salad was born, I was just tired of mayo loaded flavorless potatoes, hopefully the healthy thing will catch on ;)Have a great weekend ! This looks so fresh and amazing. 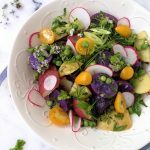 I love the colors and the combination of the purple potatoes and radishes. Beautiful. 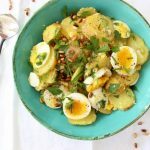 I love everything about this potato salad recipe, thanks so much for sharing! Also, I would like to talk to you about becoming a Chicory recipe partner. What would be the easiest way to reach you? Thank you very much! Shoot me an email via the contact page, with attention Chicory Recipe partner. Thanks again ! I love anything potato salad, but this one looks so inviting! I’m making this one and serving it at a large BBQ next weekend. Thanks for the idea! Rock on @Byron and please report back ! Lovely salad!Love the colors and texture! Pinned! Thanks Mira ! I hope you try it! Have a great weekend ! This is a recipe that makes me happy! Will try very soon! Oh Claudia , you are my kind of girl! I eat foods that make me happy and I shop by color ! haha! The colors on that salad! I’m sure it tastes great as well! Wow! What a beautiful salad. So healthy and pretty!